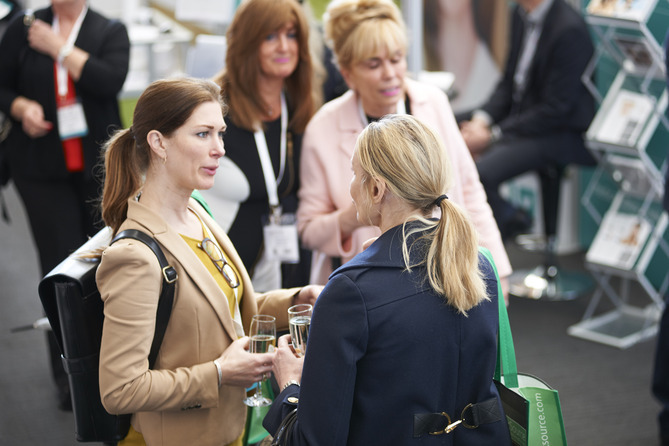 With 81 exhibitors, 57 speakers, 51 educational sessions and a record-breaking 2,118 delegates, the Aesthetics Conference and Exhibition (ACE) 2017 was a huge success! 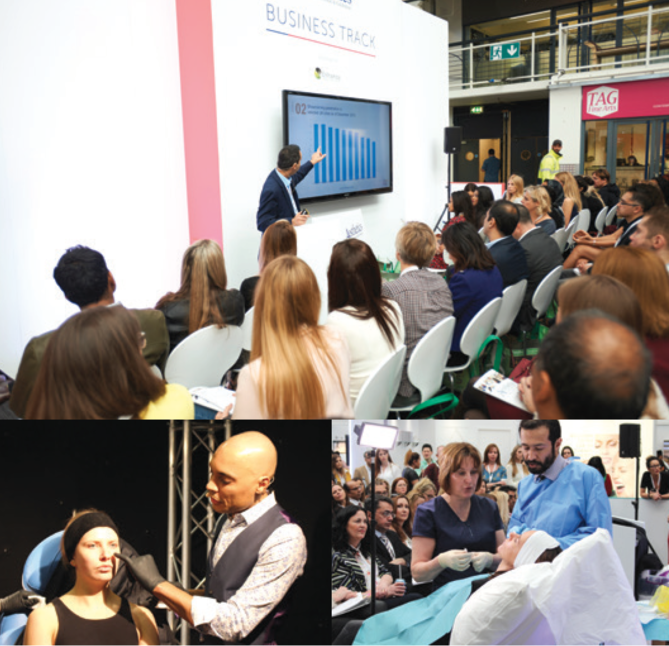 On March 31 and April 1, aesthetic professionals met at the Business Design Centre in London for two days packed with learning, innovation and networking at the leading medical aesthetic event in the UK. 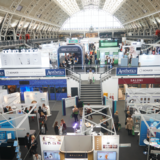 As well as being able to explore the 2,500m2 Exhibition Floor, delegates could utilise valuable learning experiences on business development and clinical practice, earning vital CPD points at every session they attended. 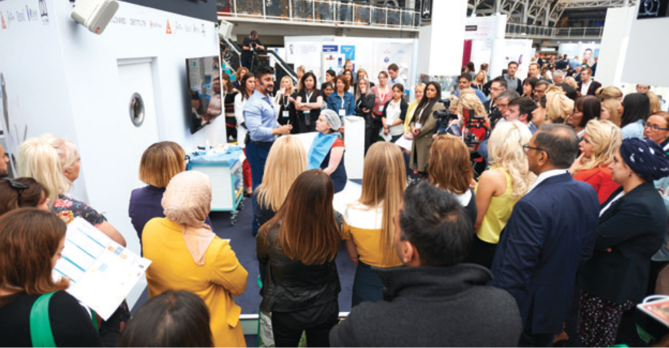 Comprising four varied and informative agendas, three of which were free to attend, delegates could watch live demonstrations and learn about a wide range of treatment indications, clinical techniques, product innovations and business support from the aesthetic specialty’s most renowned and respected professionals. Taking place in the main auditorium, the Premium Clinical Agenda was split into four sessions dedicated to facial assessment and treatment. 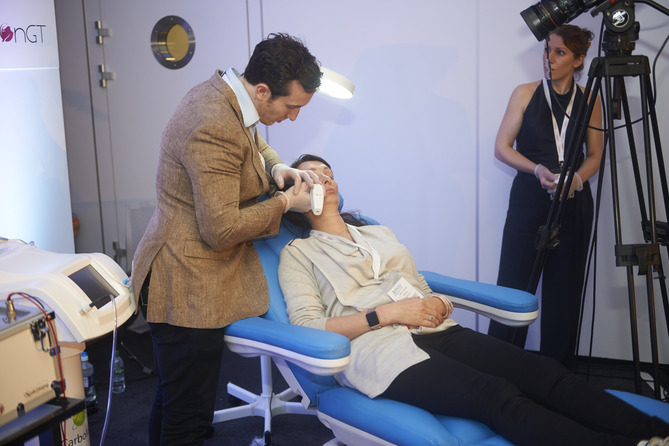 Led by the UK’s most renowned aesthetic experts, each session featured live demonstrations and interactive discussions on how to beautify the face using a variety of techniques including injectables and chemical peels. Dr Demosthenous discussed how to offer a successful consultation and take a comprehensive history, as well as how to thoroughly examine the ageing face – considering skin tone, hydration, lines and wrinkles, boney volume loss, asymmetry and dentition. Baker then detailed the cosmetic application of trichloroacetic (TCA) acid for the ageing female face, while detailing relevant facial anatomy and explaining how TCA works in practice. Following her presentation, Baker performed a live TCA peel demonstration, discussing the elastic changes in the patient’s skin, the visibility of pores and the skin’s overall thickness. Mr Humzah also performed a live demonstration of a mid-face dermal filler treatment, which focused on the lower face and the chin, detailing how it ages and advising how to enhance the jawline and balance overall facial appearance. He also engaged the audience in an in-depth discussion of facial anatomy, advising which nerves and vessels to avoid when performing injectable treatments. The Male Face: On the Friday afternoon, consultant dermatologist Dr Maria Gonzalez and aesthetic practitioners Dr Kate Goldie and Dr Beatriz Molina presented the Premium Clinical Agenda session on The Male Face. The practitioners highlighted the variations in anatomical differences between men and women, as well as the difference in skin texture, before showing the audience images of some of the concerns men could present with. Dr Molina explained how she finds that men usually come to her clinic complaining of looking tired and seeking a more youthful, energetic look; while Dr Gonzalez emphasised the need to take consideration of the skin texture, as well as the more obvious lines and wrinkles that men complain about. The practitioners each assessed and treated three models with very different concerns; including how to treat rosacea, how to masculinise a rounder face by creating a squarer jawline, and how to create facial balance. Dr Gonzalez also demonstrated her tips and techniques for using cannulas, which drew great interest from the audience. The Basics of Facial Assessment: Saturday morning began with a session dedicated to those who are newer to the aesthetics specialty – focused on teaching the fundamental skills that are so important to clinical development and mirroring the other sessions of the agenda at a learner level. 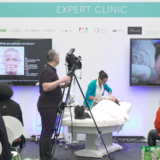 Dental surgeon Dr Souphiyeh Samizadeh, aesthetic practitioner Dr Uliana Gout and aesthetic nurse prescriber Lorna Bowes led this innovative session and presented live demonstrations of their treatment approaches. Dr Gout began by detailing the differences in the male compared to the female face; sharing advice on enhancing skin quality, shape and musculature, before performing a live demonstration of a botulinum toxin treatment and skin peel. Dr Samizadeh then reinforced the need to ‘be safe not sorry’ in her presentation on the complications that can occur as a result of injectable treatment. She shared images of patients with skin necrosis and other complications, while emphasising the importance of understanding facial anatomy and how to safely manage any issues that occur. Dr Samizadeh then performed a live demonstration of mid-face rejuvenation using fillers on an ageing female face, detailing the relevant anatomy to consider and where to inject to achieve full facial rejuvenation. Bowes then took to the stage to present on skin ageing. She emphasised that ‘preventation is better than cure’ and outlined the benefits that can be achieved by taking care of each layer of the skin and the appropriate skincare ingredients to use for enhanced results. 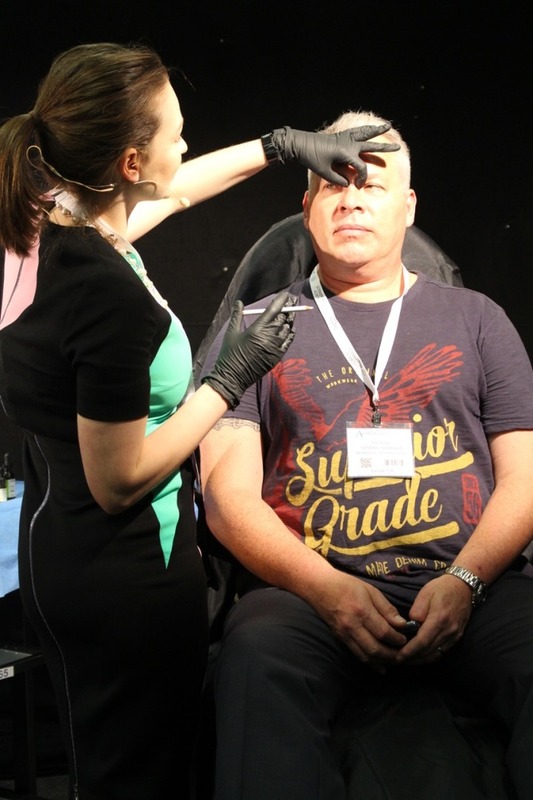 Bowes went on to perform a live demonstration of using a peel on a young female face, detailing how it should be applied safely, as well as the importance of pre- and post-procedure care. The Young Female Face: Aesthetic practitioners Dr Askari Townshend, Dr Raj Acquilla and nurse prescriber Sharon Bennett led the final Premium Clinical Agenda session on assessing and treating a female patient showing the first signs of ageing. The experts discussed how to improve general skin quality in younger patients, before Dr Townshend shared advice on managing patients with a limited budget; recommending how practitioners can provide the most effective results with a minimal price tag. He then performed a live demonstration on a 26-year-old patient, before Bennett discussed and demonstrated how to use dermal fillers to improve the skin’s hydration, evening the appearance of the eyes using botulinum toxin and enhancing the lips with fillers. Dr Acquilla gave the final presentation of the day, in which he took an in-depth look at key beauty points in order to lift and rejuvenate the face. He performed targeted injections for full face rejuvenation and shared his expert advice on improving the quality, structure and symmetry of a young female face. 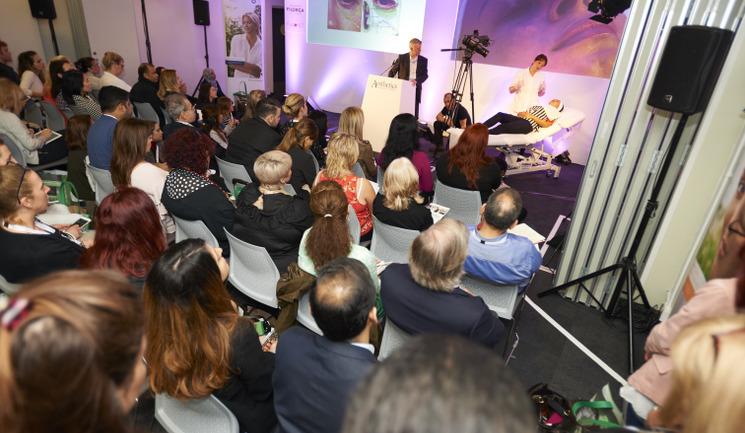 The 60-minute ACE Masterclasses gave delegates a fantastic opportunity to hear from highly respected key opinion leaders on how to get the best results from the products and treatments they use. 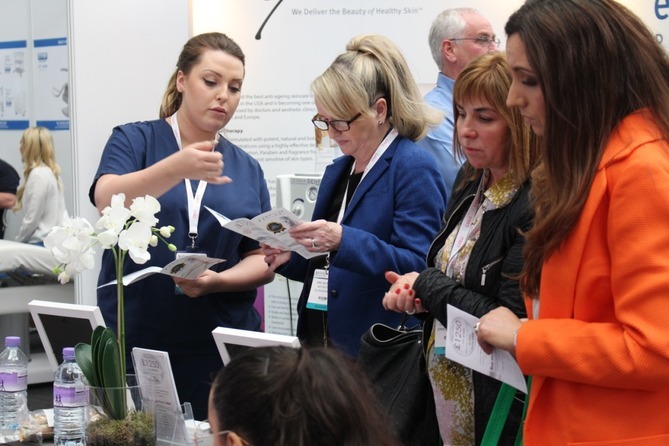 Leading aesthetic companies were able to showcase their latest and most innovative product offerings through interactive presentations and live demonstrations. The first workshop of the weekend was on PDO threads – the engaging session was led by Dr Huw Jones on behalf of Intraline, who discussed the results of a UK-based study on the biological and physical changes, as well as the effect of collagen production following thread treatment. This was followed by a Masterclass on enhancing natural beauty, led by nurse prescriber Jackie Partridge and consultant plastic surgeon Mr Mark Devlin where they outlined the science behind and efficacy of the Restylane portfolio from Galderma in a live demonstration of treatment. The use of peels was a popular topic at ACE with Dr Uliana Gout unveiling the latest trends and techniques for combining peels with cosmeceuticals in a session supported by SkinCeuticals. Next, Dr David Jack showcased how using Plexr, Needle Shaping/Vibrance and CarboMix systems from FusionGT can benefit patients, while performing a live demonstration and discussing the growing use of plasma technology. Lasers for skin rejuvenation can be a valuable addition to an aesthetic clinic, so Dr John Quinn provided profound advice on how to choose the right platform for your practice in a Masterclass supported by Lumenis. Mr Dalvi Humzah and nurse prescriber Helena Collier then drew the first day of ACE to a close with a live demonstration of mid-face volumisation and lower face contouring with Belotero+ Volume and Radiesse+ from Merz Aesthetics, which included a discussion of anatomy, physiology, facial analysis and injection technique in a special 90-minute session. Saturday’s Masterclasses began with a session led by Dr Maria Gonzalez, who shared her expertise on the use of Almirall’s Vaniqa in combination with lasers for the treatment of female facial hirsutism. Dr Kieren Bong then explained the science behind Teosyal’s Redensity I and Teosyal RHA 2 dermal fillers from Teoxane UK, and demonstrated his technique for hand rejuvenation using these products. Dr Uliana Gout went on to lead her second workshop of the event, this time she presented on using Filorga’s 360-degree combination treatments and advising on best practice, injection technique, anatomy and physiology. Harmonising the perioral region was next on the agenda in an engaging session by Dr Emma Ravichandran on defining the lips with Belotero+ at another Merz Aesthetics session. Dr Fab Equizi then looked at the use of the Plasma BT from Beamwave Technologies, discussing with delegates how this can be used to treat eye bags, excess skin and wrinkly eyelids with reduced downtime and risk compared to surgery. The Masterclass agenda concluded with Dr Dev Patel and Victoria Hiscock’s presentation for Alumier MD on the benefits of light and medium-depth peels for both clients and businesses, in which they also performed a live demonstration of a self-neutralising, modified half-Jessner chemical peel. This year saw the introduction of the free, new-look Expert Clinic. 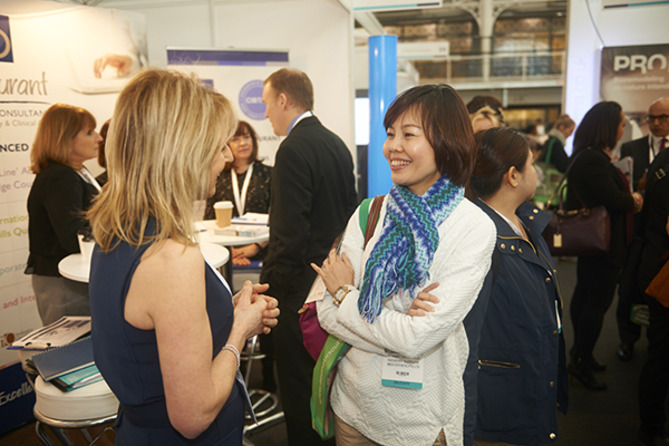 The larger space with enhanced sound quality and accessibility offered delegates the chance to attend half-hour sessions on all aspects of clinical practice. The Friday morning began with an engaging talk on using radiofrequency from nurse practitioner Anna Silsby, sponsored by AesthetiCare, which was followed by an injectable presentation from Dr Tahera Bhojani-Lynch on contouring the male face with Radiesse+ from Merz Aesthetics. Dr Rikin Parekh then demonstrated lip augmentation and rejuvenation of the lower face using the Biorivolmetria concept from Regenyal Laboratories’ range of HA fillers, sponsored by Belle, before Dr Shirin Lakhani showcased a non-surgical blepharoplasty using Plexr, from Fusion GT. Following lunch, a live demonstration of the U225 meso injector was performed by Mr Jean-Paul Ben in a session sponsored by Rosmetics, while Church Pharmacy’s speaker, experienced aesthetician Radha Parmar demonstrated how its retinol skincare range, PCA Skin, can enhance patients’ skin. Dr Lee Walker was the next practitioner to take to the stage in a packed session for his lip augmentation demonstration. Sponsored by Teoxane UK, the session discussed the anatomy of the lip, danger zones to be aware of and injection techniques for a perfectly balanced lip. Victoria Hiscock, product and education specialist at AlumierMD then discussed ‘mindful peeling’ emphasising key application and removal techniques to consider when performing a chemical peel. Mesotherapy was the next topic on the agenda, which was covered by Dr Sophie Shotter in AestheticSource’s Expert Clinic session on the use of its RRS range of CE Class III mesotherapy cocktails. Finally, Dr Ravi Jain brought the day to a close with a discussion on Profhilo from HA-Derma, in which he outlined its unique properties and his experience of using the HA technology in practice. The second day of Expert Clinic sessions offered even more variety and valuable learning opportunities across all its sessions. Beginning with a presentation on the use of Dermamelan from Dr Fernando Galcerán on behalf of mesoestetic, delegates were able to learn more about treating hypermelanosis. Miss Sherina Balaratnam then gave an engaging presentation on the SculpSure device from Cynosure, outlining how it can be used to contour the body and reduce stubborn fat in problem areas such as the abdomen. Next, Dr Irfan Mian was introduced to discuss how Profhilo and Aliaxin from HA-Derma can be combined for superior results, followed by a fascinating presentation on volumising and projecting the mid-face with Belotero+ from Mr Simon Ravichandran, sponsored by Merz Aesthetics. Microneedling was next on the agenda, in a joint presentation from nurse prescriber Natali Kelly and Dr Andrew Christie on the use of the Dermapen from Naturastudios to infuse active substances into the skin for enhanced results. This was followed by Dr Mariya Serheyeva’s engaging presentation on the new biorevitalising PRX-T33 from Medical Aesthetic Group, which aims to protect skin tissues and stimulate both keratinocyte and fibroblast growth factor activity. Dr Rikin Parekh then took to the stage for a second time and concluded the weekend of learning at the Expert Clinic to discuss the modalities of RRS administration from AestheticSource. 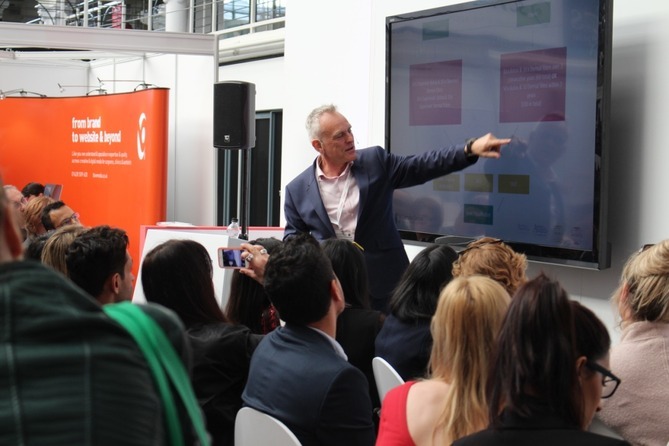 Sponsored by Enhance Insurance, the ACE Business Track delivered 18 dedicated non-clinical sessions to delegates on how to improve business acumen and build a profitable practice. Amongst those speaking was clinic director Rudi Fieldgrass who advised how to grow an aesthetic business and popular ACE speaker and VAT advisor Veronica Donnelly who gave her annual VAT update. The morning also saw private label skincare founder Gary Conroy providing his recommendations on choosing a skincare brand for your clinic, which was followed by Dr Simon Zokaie’s presentation on the influence of online product purchasing and how it could impact an aesthetic clinic. Director of Enhance Insurance Martin Swann then spoke on the importance of risk identification and how General Data Protection Regulation could impact aesthetic practitioners next year. He advised that all practitioners should understand its implications and be prepared for its introduction. This was followed by insurance broker Naomi Di-Scala, who provided an overview of common complaints in the specialty with advice on how to manage them, before Dr Tristan Mehta talked about training options for practitioners and standard development initiatives. Continuing the training theme, consultant plastic surgeon Mr Adrian Richards spoke about the new Joint Council for Cosmetic Practitioners (JCCP), detailing its latest recommendations on regulation and training, which drew an even larger crowd of delegates prepped with questions and comments for discussion. PR consultant Julia Kendrick then shared her expert advice on how to build a brand with PR, before multiple clinic owner Annalouise Kenny concluded the day at the Business Track with advice on opening a new clinic. Saturday at the Business Track began with a valuable presentation on the importance of data collection from enquiry handling and diary management expert Gilly Dickons, before consultant educatalists Hayley Allan and Lisa Hadfield-Law shared top tips on presentation skills for those interested in going into training. Lucy Xu, clinic chain founder, then spoke on how to build a business, before Mr Dalvi Humzah gave his third presentation of ACE 2017 on the legal implications of the General Medical Council reviewing your practice and how you can ensure that you maintain competent standards of practice. Lawyer Alaw Rhys-Owen then shared her perspective on the themes and practices that are commonly seen within aesthetic claims, in a session sponsored by Enhance Insurance, before Dr Rita Rakus shared her advice on choosing the right capital equipment in order to grow your business. Dr Harry Singh was next to the stage to talk about key marketing strategies for the best return on investment, followed by nurse prescriber Lorna Bowes, who closed the agenda with a detailed presentation on how to build a treatment menu which differentiates your delivery and presents a cohesive brand to your patients. 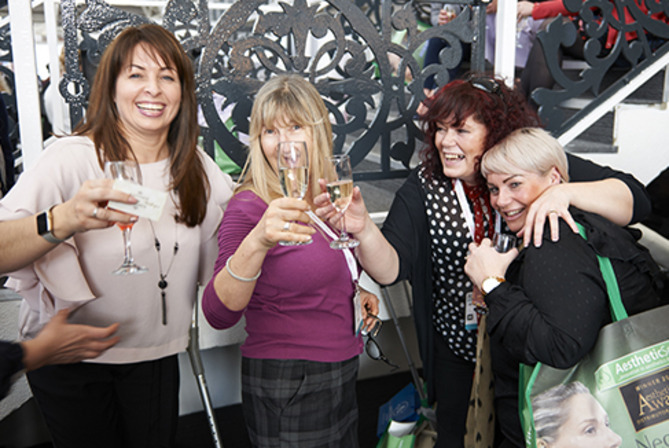 After a busy first day of learning and exploring the Exhibition Floor, all delegates were invited to enjoy a complimentary glass of prosecco from the ACE 2017 Networking Sponsor, 3D-lipo. As always, this important part of the day was appreciated by delegates who were able to catch up with friends and colleagues, while also being able to build business connections and liase with conference speakers. With 2,500m2 of floor space and 82 exhibitors on hand to showcase their latest innovations, the ACE 2017 Exhibition Floor showed a busy, hustling scene on both Friday and Saturday. Delegate and aesthetic nurse Judith Gray said, “There’s such a wide variety of things to do on the Exhibition Floor. 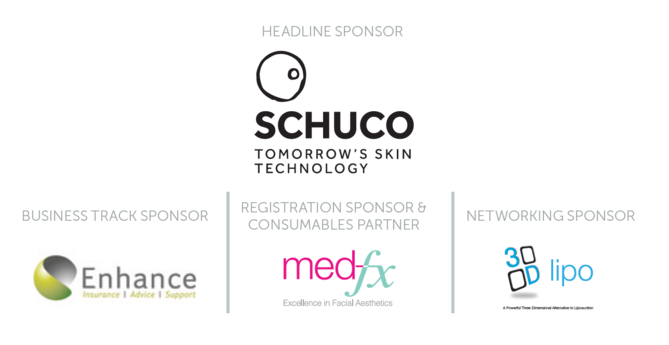 Not only watching the live demos, but finding out about the latest technology and products that come out was really useful for me!” This year’s headline sponsor was Schuco and on their busy exhibition stand they held live demonstrations from leading practitioners, which each drew large crowds of delegates. 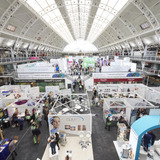 ACE 2018 will be held on April 27 and 28 at the Business Design Centre in Islington, London. 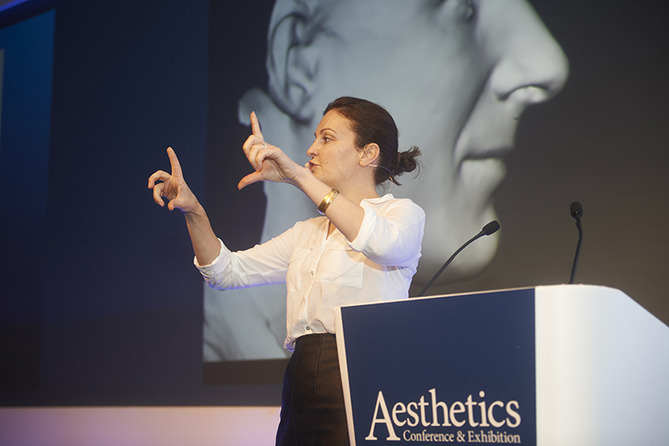 To stay up-to-date with all the latest news and developments join the Aesthetics conference website www.aestheticsjournal.com.